Hey Guys! In the November issue of InSTYLE Magazine I saw an ad for a brand new nail product. I immediately knew I needed to try this product. The Nutra Nail Gel Perfect. I have told you guys before that I am always looking for something I can do to my nails to keep polish on for longer than a day or two. I tried the Salon Perfect Sally Hansen nail strips and did not get the results I wanted. They chipped s hortly after I applied them just like nail polish does. The Nutra Nail Gel Perfect is an AT HOME gel nail process. I got this for a little over $12, so I figured it's worth a try if it can save me the money of going to a salon to get gel or shellac nails!!! 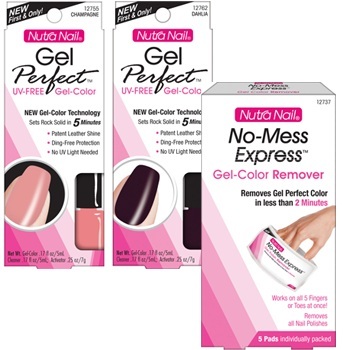 The Nutra Nail Gel Perfect nail product is UV free so you don't need to buy a light to use. LOVE. I am into day three of having this on my nails and my nails still look perfect. It was very easy to apply, it dried quickly and it seems to make my nails a bit thicker and stronger which I do not mind. I got the sheer pink. It was very sheer and I definitely had to do 2 coats. I think I could have even done 3 coats. But, I definitely want to try this in a darker color as well to see how many coats are needed. I have not removed this yet so I will have to do an updated post telling you about my final thoughts on the product. Just wanted to let you all know that this product exists! The Nutra Nail Gel Perfect. I got mine at CVS, but I've heard they sell it at Ulta and probably other drug stores as well. I did NOT see it at Target. Hope you all have a fabulous Monday! Talk to you all soon.